Most people are aware of how important it is to recycle. Recycling saves energy and reduces waste. Unfortunately, a lot of items we think we can recycle are going straight to the landfills. Below are just a few common items that should stay out of your recycling bins. 1.) Plastic Grocery Bags – Just because something is made from plastic, does not mean it can be recycled. Plastic bags can get caught in machinery and damage equipment. Many grocery stores offer programs and will accept your old plastic bags. 2.) Anything with food stuck to it – That’s right, greasy pizza boxes and used paper plates cannot be recycled. These items are contaminated and will be rejected. Leave anything with left over food on it out of your recycling bin. They can damage machines or contaminate other recyclables. 3.) Colored paper – Construction paper containing dyes will not be accepted at recycling facilities. 4.) Styrofoam – You cannot recycle Styrofoam of any kind. It is a wise decision to cut down on Styrofoam coffee cups and any packaging material containing it. 5.) Shredded paper – Those little pieces of paper are clogging up the machinery. 6.) Plastic Bottle Caps – Even though you may be able to recycle the bottle, the plastic bottle cap is usually made out of a plastic that cannot be recycled. 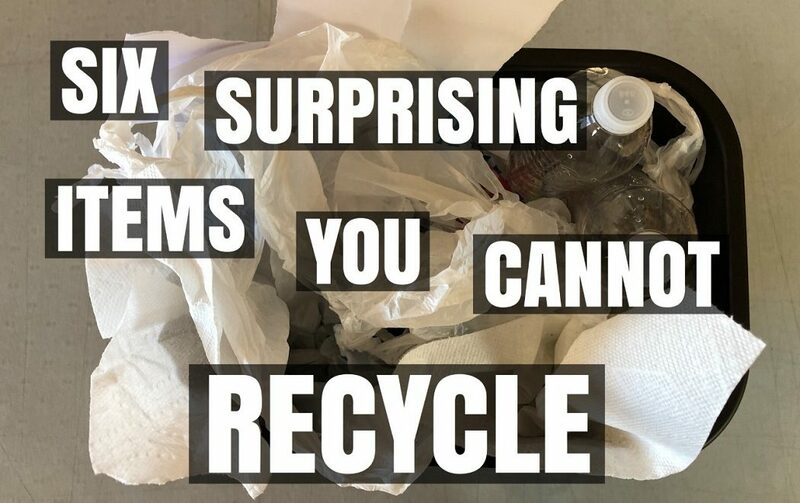 Not sure if something can be recycled? Contact your community, as guidelines may differ. For more information, be sure to check out our website.